With only three pieces on the program it wasn’t exactly a Retrospective. Nor was it a Recital (as in ‘here’s what I do’). Better than either of these, it was an Event! Cursive for flute and piano was beautifully played by Jayn Rosenfeld (flute) and Christopher Oldfather (pianist, with coloristic inside plucks, et al). Cursive hand-writing which is no longer taught or readable by young people, was Chou’s bridge to the calligraphies of Asia. I resolved then and there to practice my own cursive which is now deficient from over-use of the computer. The piece was quite atonal on first listen. Twilight Colors for a luscious sextet of three winds and three strings, was the first piece on the program, played vividly by Boston Musica Viva, and conducted by Richard Pittman. Right away I felt a difference in the role of rhythm. A dotted rhythm, a triplet was not a Western “authority figure” driving the music motivically. Rather, it was more like a loving receptacle of a sound, of a tone, of several tones. There was room for a breath of contemplation, time slowed down. Different from Cage’s ‘let the sounds be themselves,’ but equal in setting itself apart from the European grammar of connection. Echoes from the Gorge was the last piece on the program, played brilliantly by the percussion quartet,Talujon, on a large array of quite standard Western percussion instruments. A glorious noise piece in many movements. Often in the silence between movements the wooden chimes, charmingly, had a few more soft sounds left to say. I was thinking while listening: all these instruments, didn’t they come from “the East?” I watched one player repeatedly strike the giant tam-tam near its rim with three small-headed mallets, eliciting nothing but high piercing frequencies, not the low bonging we expect from a big gong. Just then there was a huge noisy climax of “ear-cleaning” zinging tutti tremolos. Since color was a theme of the concert, I must report that all but two of the players wore the standard ho-hum uniform of black. Only Jayn Rosenfeld in a pale purple blouse, and Christopher Oldfather in a mauve shirt, begged to differ. It was a small, but loving audience. Chou Wen-chung came up on stage to receive the applause and a bouquet. Small, dapper, charming, with a full head of grey-flecked hair—when I introduced myself later, he graciously thanked me for coming to the concert. 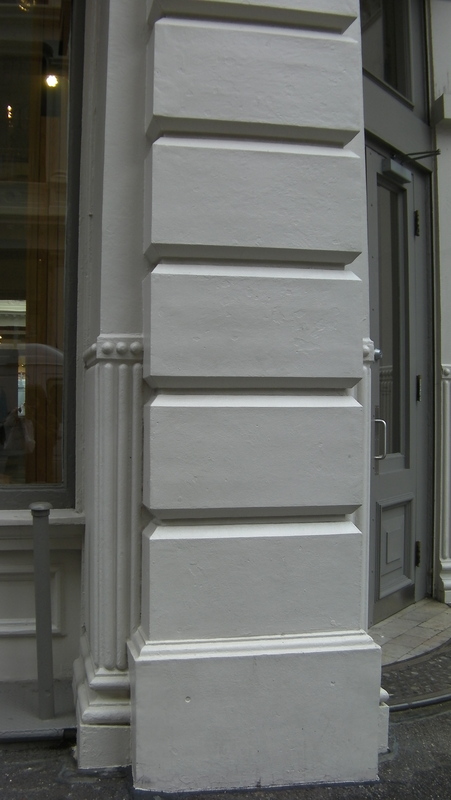 PLAY A BUILDING IN F – IN SOHO! December 21st, Saturday, 2 PM, Meet in the park at Spring Street and 6th Avenue. Event lasts less than an hour. Daniel Goode Featured on Make Music New York Blog! Check out this feature of Daniel Goode on MMNY. “Composer Daniel Goode will lead participants, aided by a neighborhood map and suggested drumming rhythms, through a portion of Soho’s cast iron district. Using their hands, the group will drum on the hollow cast iron fronts of the “best” buildings. The piece ends when a select number of buildings have been turned into musical instruments.” MMNY Winter Feature! Flexible Orchestra – 8th Year – Nov. 9 at Roulette in Brooklyn, 8 PM, $15/10 – 509 Atlantic Av. @ 3rd Ave. Featured will be Guy Klucevsek’s “Suite for Accordion and Flexible Orchestra.” This is the 2nd year of the “Accordions Plus” format for the orchestra, with five accordions, violin, cello, bass, flute, and percussion, conducted once more by Tara Simoncic, who has led the Flexible Orchestra since its debut in 2004. Guy will also be soloist in orchestra-member, Kamala Sankaram’s new commissioned work, “Second Moon.” Daniel Goode, artistic director and founder, will present “Adagietto-ed” which reworks Gustav Mahler’s “Adagietto” from the Fifth Symphony for the Flexible Orchestra, using toy accordions from Chinatown. Barbara Benary, director of Gamelan Son of Lion, long time collaborator of Mr. Goode’s, who composed for the “trombones plus” format of 2006, offers her “Accordingly,” featuring Kamala Sankaram, soprano. Melissa Tong-violin, Kate Dillingham-cello, Pawel Knapik-contrabass, Karl Kraber-flute, Barbara Merjan-percussion. Flexible Orchestra was formed by composer, Daniel Goode, in 2004 with the purpose of having an ensemble of about fifteen sound as full as a symphony orchestra—through strategic orchestration. One larger section from one instrumental family gives the mass effect, plus a smaller section of varied instruments which is there to complement, contrast, and “spice up” the ensemble. The first Flexible Orchestra was 12 cellos, flute, clarinet, and trombone. Each format is planned to last two years. The second two-year orchestra was 10 trombones, 2 clarinets, 2 contrabasses, and piano with amplified viola, marimba, gamelan gongs added in one instance. All the music is composed expressly for the orchestra, or arranged for it. An added benefit is that with a section of cellos, or trombones, or flutes, or accordions already in place it is able to do revivals of mono-timbral works which rarely get performed after their premieres. So eight amplified cellos did an early Lois Vierk work; ten trombones did a early Frederick Rzewski work; eleven flutes did Henry Brant’s 1932 “Angels and Devils.” The orchestra has done arrangements of Christian Wolff, Kent Kennan, and others. The New Yorker called it “Daniel Goode’s big avant-garde combo,” and Time Out said the name of the ensemble “implies a certain frame of mind.” Both true! Daniel Goode, composer-clarinetist lives in New York, is founder of the Flexible Orchestra a new concept in orchestral sound, co-director of the DownTown Ensemble, member of Gamelan Son Lion. Recent work is the opera, French Arithmetic premiered 2010 by the Flexible Orchestra’s concert of new works and revivals for its latest array of seven accordions, three strings. The concert is FREE. They are accepting donations of food, toiletries, and clothing for the Homeless Outreach & Advocacy Program.